John Benjamin Kendrick (September 6, 1857 – November 3, 1933) was an American politician and cattleman. He served as a United States Senator from Wyoming and as the ninth Governor of Wyoming. Kendrick was born near Rusk, Texas to John Harvey Kendrick and Anna (Maye) Kendrick. He grew up on a ranch and attended the public schools in Texas until he was in the seventh grade. In March, 1879 he moved cattle from Texas to Wyoming (1,500 miles). He arrived in Wyoming in August, 1879 and settled on a ranch near Sheridan, where he raised cattle as a cowboy, ranch foreman, and later cattle company owner. He married Eula Wulfjen (his employer's daughter) on January 20, 1891. Kendrick worked as foreman for his father-in-law's cattle company from 1879 until 1883. He was employed by (and invested in ownership positions in) the Lance Creek Cattle Company (1885), the Converse Cattle Company (1887, owner in 1897). Kendrick was also President of the First National Bank of Sheridan from 1900 to 1902. In 1909 he was elected President of the Wyoming Stock Growers Association. He was a member of the Wyoming State Senate from 1910 to 1914 and was an unsuccessful candidate for election to the United States Senate in 1913. He was a delegate to the Democratic National Convention from Wyoming in 1916 and 1924. 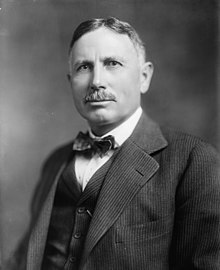 He then served as Governor of Wyoming from 1915 until he resigned in 1917, having been elected as a Democratic candidate to the United States Senate in 1916. Kendrick was reelected to the Senate in 1922 and 1928 and served from March 4, 1917, until his death at Sheridan, Wyoming, in 1933. In 1932 he received an honorary law degree from the University of Wyoming. He served as chairman of the Committee on Canadian Relations (Sixty-fifth Congress) and member of the Committee on Public Lands and Surveys (Seventy-third Congress). He was credited with beginning the investigations into the Teapot Dome scandal, a bribery incident that took place from 1922 until 1923. He introduced legislation that helped create the Grand Teton National Park in northwestern Wyoming. Kendrick was inducted into the National Cowboy Hall of Fame in 1958. ^ a b c d e Bartlett, p. 255. ^ a b c d e Peterson, p. 5. ^ a b "John Benjamin Kendrick (1857-1933)". The Political Graveyard. Retrieved November 18, 2012. ^ "Sen. John Kendrick". Govtrack.us. Retrieved November 18, 2012. ^ a b "Wyoming Governor John Benjamin Kendrick". National Governors Association. Retrieved November 18, 2012. ^ "KENDRICK, John Benjamin, (1857 - 1933)". Biographical Directory of the United States Congress. Retrieved November 18, 2012. ^ "John Benjamin Kendrick". NNDB. Retrieved November 18, 2012. This page is based on the Wikipedia article John B. Kendrick; it is used under the Creative Commons Attribution-ShareAlike 3.0 Unported License (CC-BY-SA). You may redistribute it, verbatim or modified, providing that you comply with the terms of the CC-BY-SA.